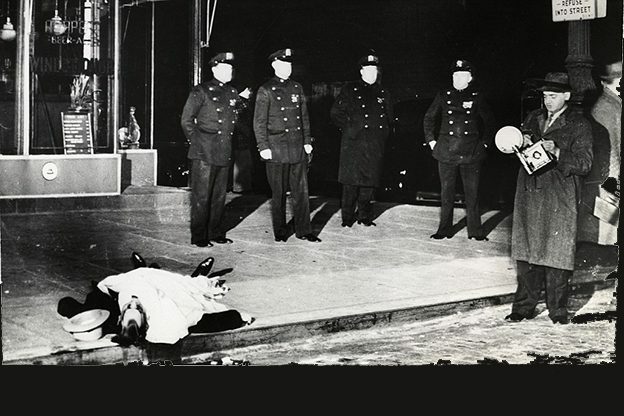 Murder is my business - Weegee	(www.dailymail.co.uk). I don’t know about the rest of you, but I’ve found the journalists’ game of Buzkashi over the carcass of Mohamed Noor to be distressing and distasteful. The demand by journalists to see the disturbing and lurid body cam video as it is shown to the jury (and then undoubtedly reported and commented on while the jury is probably not sequestered) is simple voyeurism. Voyeurism with the potential to prejudice the jury. There is a hearing this afternoon brought by media to see the body cam video when shown at the trial. This is the appetite of the ghouls and yird swine: the eaters of the dead. Would that the reporters and editors of, say, the Strib were on trial for homicide sometime. I’ll bet it would be sobering for them. They’d probably worry about being sandbagged by the media. It would be a legitimate concern. A local reporter tweets that jury selection can “drag on.” The lawyers involved in the case might describe it as being careful; it’s all in the perspective. A local newspaper opines that “the eyes of the world are on us.” Indeed, as we turn ourselves into a pack of slavering jackals. I’m sorry; I meant champions of the First Amendment. Perhaps the same newspaper would like to sit in the jury room, just to listen, of course. That’s next. You can tell from my profile photo that I am an older person. I’ve been in court scores and scores of times (well, more than that). I don’t recall a journalist ever being there. Why? Because although I’ve tried cases involving boatloads of money, they were not sensational like the Noor case. You don’t sell newspapers, or clicks, out of the business section. So, my friends in the media, cover the trial, but don’t be Weegee. Oh Oh! Lying lawmakers. Who’d have thought? Is the Fourth Estate actually a Kangaroo Court?